The Peloponnese is a large peninsula in Greece. 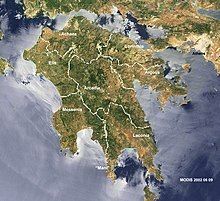 It is the part of Greece which is south of the Isthmus of Corinth. The island of Peloponnese has lots of mountains and coasts, with the highest part being Mount Killini. There are four south-pointing peninsulas within the Peloponnese. They are called Messenia, the Mani Peninsula, Epidaurus, and the Argolid. There are also two groups of islands near the Peloponnese. In the east there are the Argo-Saronic Islands and in the west there are the Ionian Islands. There is also the island of Kythira, which is near to the Epidaurus peninsula. Kythira is often thought of as part of the Ionian Islands. The Peloponnese has had people living on it since prehistoric times. Its name means Island of Pelops. Pelops was a person from Greek mythology, who took over the island. During the Middle Ages and the Ottoman Empire, the peninsula was known as the Morea. This page was last changed on 14 November 2013, at 17:31.